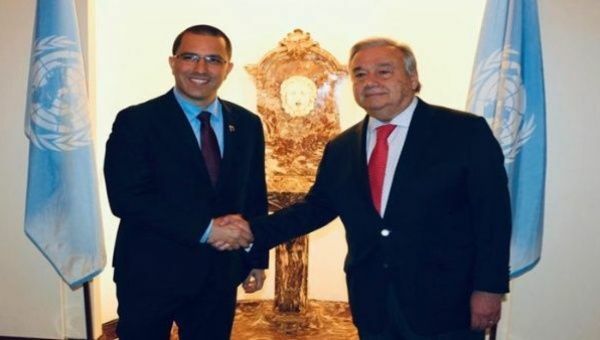 Feb 11 (teleSUR) Venezuela’s Foreign Minister Jorge Arreaza met Monday the UN Secretary General Antonio Guterres in order to strengthen programs of cooperation with health, food and education, among others. On Friday, Guterres officially recognized the representation of the Venezuelan Government – led by its Foreign Minister Jorge Arreaza – while rejecting the interests of deputy of the National Assembly (AN) Guaido. 23. He then also expressed his preference for “lower tensions” in Venezuela and called for all relevant parties to commit to an inclusive and credible political dialogue. However, the United Nations chief said it will not join any group of nations promoting a political initiative to resolve the crisis in Venezuela “in order to give credibility to our continued offer of good offices to the parties to be able at their request to help find a political solution,” said Guterres.